Ahavath Sholom religious school students plant bulbs as part of the Daffodil Project, Nov. 11. They marked their bulbs with decorated stones. Last year, the TJP shared the story of Grace Goldman. The then-Fort Worth Country Day Senior who brought The Daffodil Project to her school to honor the memory of her great-grandmother Blanche, who survived Auschwitz and the 1.5 million children who perished in the Holocaust. This year, Goldman’s grandmother Rachel Goldman (Blanche’s daughter) and Debra Rosenthal helped the Jewish Federation of Fort Worth and Tarrant County underwrite the project to include all Tarrant County congregations. The bulbs were supplied and purchased through Am Yisrael Chai, an Atlanta-based Holocaust education and awareness organization. 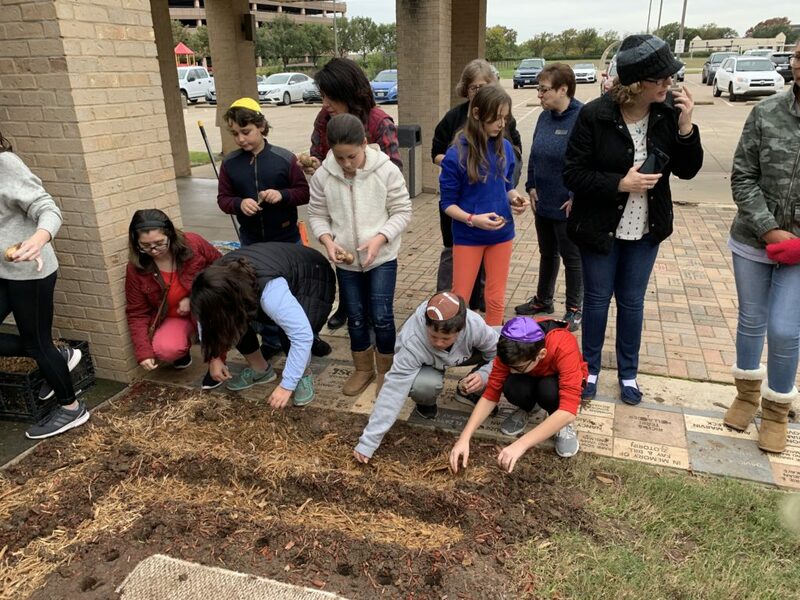 On Nov. 11, the project came to fruition when Congregation Ahavath Sholom, Beth-El Congregation, Congregation Beth Israel and Congregation Beth Shalom planted the bulbs. “We are grateful to the leadership and financial support of Rachel and Michael Goldman for making this special project possible and we are proud to have partnered with them. Thanks to their leadership, many of our community organizations are participating and this will be a wonderful ongoing teaching tool to help our children understand the horrors of the Holocaust and to remember the 1.5 million children who perished,” Federation Executive Director Bob Goldberg said. At Congregation Beth Shalom in Arlington, 40 Sunday school children and congregants gathered to plant 500 yellow daffodil bulbs. In Colleyville, a member of the congregation working on his Eagle Scout project coordinated the synagogue’s efforts, according to Rabbi Charlie Cytron-Walker. Rabbi Andrew Bloom of Congregation Ahavath Sholom was pleased his synagogue participated.